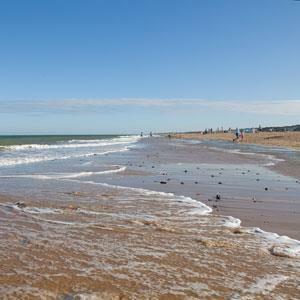 Winterton-on-Sea Beach BeachWinterton-on-Sea near Great Yarmouth has mile upon mile of pale, sandy beach stretching into the distance. Overlooked by the graceful white blades of the Bloodhills Wind Farm to one side and low sand dunes to the other, this is a great beach where you can escape from it all, with not an amusement arcade in sight. Alongside the beach is the Winterton Dunes National Nature Reserve which is managed by English Nature and is home to the rare Natterjack Toad which breeds in the shallow pools behind the main dune ridge. A wide range of both breeding and overwintering birds can be seen including the little terns on the foreshore. Just north of Winterton a colony of grey seals live and can be regularly seen basking on the beach or popping their heads above the water. Parking is available in a pay & display car park to the south of the reserve. Light refreshments are available from the Beach Cafe. Public & disabled toilets are also available at the entrance to the beach. 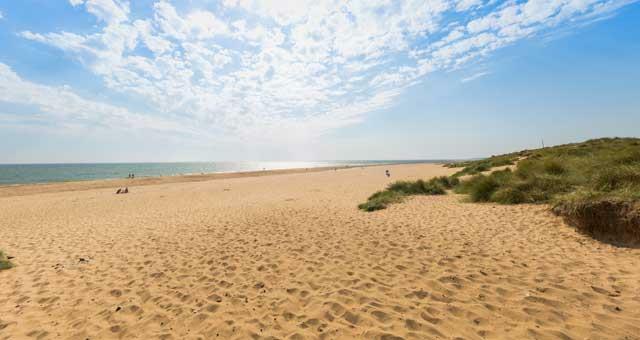 Winterton-on-Sea near Great Yarmouth has mile upon mile of pale, sandy beach stretching into the distance. When arriving in Great Yarmouth follow the signposts for the A149 to Caister on Sea. At roundabout take the 2nd exit onto Caister Bypass, signposted Hemsby. At second roundabout take 2nd exit and continue forward onto Scratby Road follow signs for Hemsby and the Winterton. Public Transport is very limited to Winterton and details should be checked before travelling.